These Conversation Hearts Mendiants just might be the easiest and cutest treat you can make for Valentine’s Day. 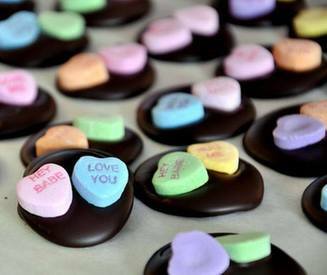 They’re simply rounds of dark chocolate that are topped off with conversation hearts, so they are not only sweet, but they deliver a sweet message to your Valentine! I used Sweethearts – the original conversation hearts - in these treats and found that they actually pair very well with chocolate! They’re sugary, but they have distinct flavors to them (orange, strawberry, green apple, etc.) and those flavors were actually highlighted by the chocolate – which meant that these candies were much more delicious with a little dark chocolate than they were without it.